"Marriages are made in heaven"-This is indeed a very popular adage. Marriage is a lifelong commitment that needs to be cherished forever. We all "promise" to stay together through thick and thin. We don`t promise to stay together "until we get bored" or "until someone better comes along" or "until we are not happy anymore". You promised forever, and promises are meant to be kept". But today, many marriages are ending up in divorce. If you think your marriage is a failure because you and your spouse aren`t following certain rules, Dr.Phil blows a whistle on the 6 most common but dangerous marriage myths. Myth#1: A great relationship depends on a great meeting of the minds. You will never see things through your partner`s eyes because you are two different individuals, genetically, physiologically, psychologically and historically. You will not solve your problems by becoming more alike in your thinking. Recognize that a relationship is far more enjoyable when you`re with someone who enriches your life, not simply reflects it. Appreciate your differences. Myth#2: A great relationship requires great romance. Yes, your life with your partner should include plenty of romance. But don`t kid yourself and expect an unrealistic Hollywood fairytale. The truth is that in the real world, being in love is not like falling in love. Falling in love is only the first stage of love. It`s impossible to remain in that stage. A mature relationship will shift from dizzying infatuation to a deeper and more secure love. Don`t make the common mistake of thinking that when the initial wild passion fades, you aren`t in love anymore. The answer is to learn how to move on to the next stages of love for a different but richer experience. Myth#3: A great relationship requires common interests that bind you together forever. There is nothing wrong with your relationship if you don`t share the same interests and activities. If you and your partner are forcing yourselves to engage in common activities but the results are stress, tension, and conflict, don`t do it! •Don`t abandon the issue and attack the worth of your partner during an argument. •Don`t seek conflict because it`s stimulating. •Don`t pursue a take-no-prisoners approach in your arguments. •Don`t avoid achieving emotional closure at the end of an argument. 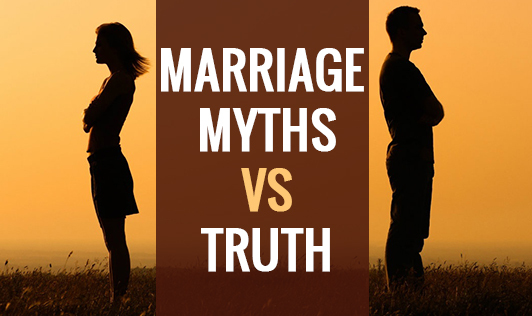 Myth#5: Your relationship can become great only when you straighten your partner out. Don`t fall into the trap of believing that if you could change your partner, your relationship would be better. You are, at the very least, jointly accountable for the relationship. Let go of the childlike notion that falling in love means finding someone who will be responsible for your happiness. You need to take responsibility for your own happiness. If your relationship is distressed, the most important person for you to change might be yourself. Once you identify the payoffs you are subconsciously seeking with destructive behavior, you can choose to remove them from your life. Myth#6: There is a right way and a wrong way to make the relationship great. Nothing could be further from the truth. There is no definitive "right way" to be a good spouse, good parent, or to handle any relationship challenge that life throws at you. Do what works for you rather than following some standards you might have read in a book or heard from a well-meaning friend. If what you and your partner are doing is generating the results you want, stick with it. If both of you are comfortable with the principles that work, you can write your own rules. Remember not to be rigid about the way in which you accept your partner`s expressions of love. There is no "right way" for someone to love you. The fact that your partner expresses feelings differently doesn`t make those feelings less genuine or of less value. Finally, don`t get deceived by the initial rush of intimacy and romance or panic when it wears off! Marriage is indeed one of life`s most challenging arenas and in a world twirling with false images of romance and love, the more we know, the more effective we can be in building a great marriage. Remember that the ingredients of lasting passion and love in a relationship are very different from what you see on TV & in movies!